This Carbon Mods NACA Vent is designed to the an official NACA specification and is therefore guaranteed to match the performance characteristics of that design. Is is flatter in profile than our NACA Ducts making it more suited to venting than to duct attachment. 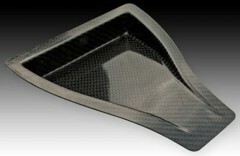 The vent is manufactured from 1mm of 100% 2/2 twill 3k carbon fibre making it incredible strong and ultra-light weight. The duct has a high gloss finish on the visible surface and a smooth satin finish to allow of effective bonding on the reverse. Aesthetically, the vent displays the characteristic genuine carbon fibre weave on both surfaces that adds the ultimate in performance styling to your vehicle. Installing the ventThe NACA vent can be installed in a variety of ways depending upon the application. In all circumstances, the body panel will need to be cut to allow the vent to sit flush on panel surface. Download and print the template below to enable you to cut the correct shape in the body panel. NACA Vent Installation Template PDF. Typically, installation to provide general air-flow to a region will require no more work than to open up a suitable slot at the back of the vent(this can be done for you at our factory on request), cut the body panel using the template above and bond the vent to the panel using SikaFlex or similar adhesive. Other installation might involve ducting the airflow once it is inside the vehicle or leaving the vent closed if it is simply being used as a styling feature.